Email verification is a powerful tool for your business. With DeBounce, your email list will always be fresh and effective. With no bounce. Period. Remove invalid and hard bounce email addresses from your database using SMTP check. Checks to see if the email address is from a disposable email provider like Mailinator. DeBounce Email Verifier can identify domains that are catch-all, which return valid for all emails. All the duplicate Email addresses are removed automatically. 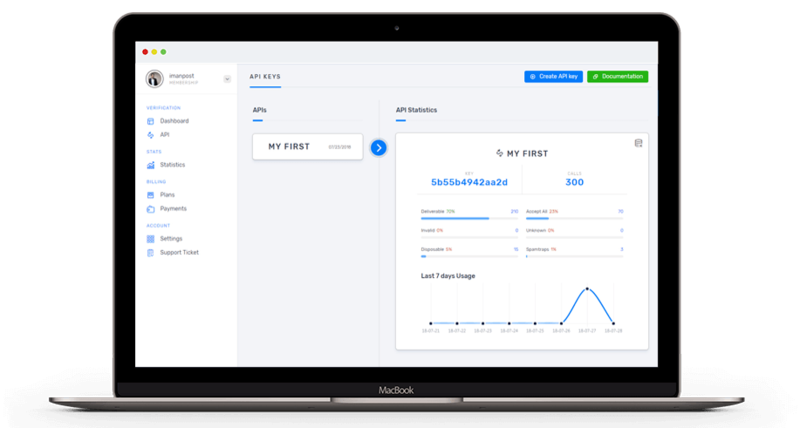 DeBounce API allows you to verify email addresses instantly on your platform. DeBounce App allows you to only download the results you want. All records of spam are removed thanks to our Intelligent Spam-Trap Indicators. The email addresses containing inactive, invalid or parked Domains are removed. Duplicate emails are exactly that, the same email address appearing on your list multiple times. Invalid mails are email addresses missing necessary parts. Temporary emails are generated for a fixed period, often just 10 minutes. Bad MX emails have a non-existent domain after the '@' symbol or there is something wrong with the domain. These are addresses that are only for forwarding purposes – any email you send will be forwarded somewhere else. These emails are often ‘fake’ addresses which never existed. Spam traps are usually e-mail addresses that are created purely for luring spam, not for communication. 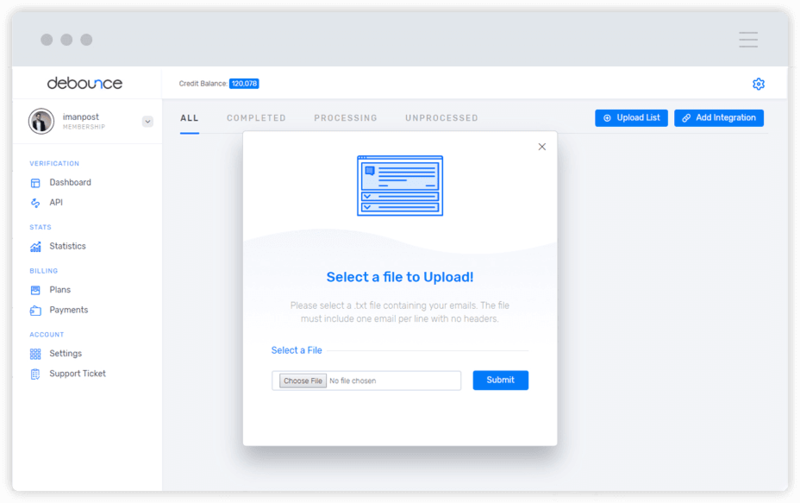 From your dashboard, easily upload and clean your lists, verify a single email address and download your segmented result. 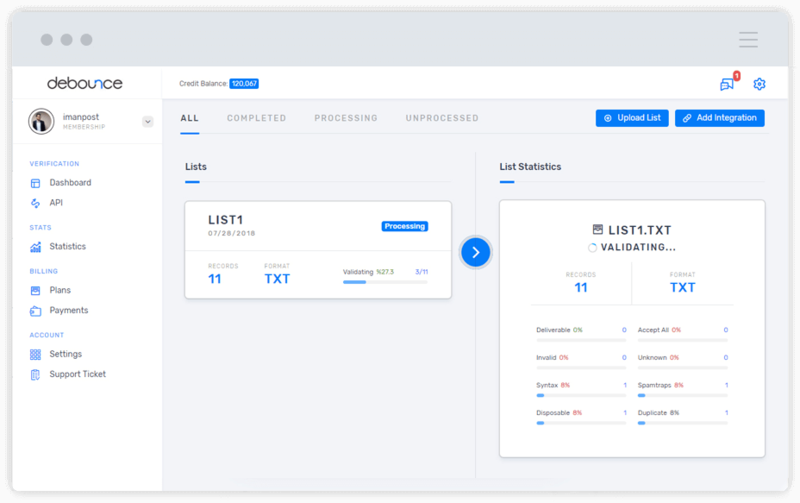 Step 1Upload your email list in a TXT or CSV format file by dragging a file into the dotted area and wait for application to process your list. Duplicated row will be indicated and you do not pay for duplicates. Step 2We start processing to make sure your list does not contain bad emails. All syntax, spamtraps, bounce, catch-all and disposable emails will be identified with DeBounce. You may also select to enrich your list along with validation process. Step 3Once your list has been verified, you can download your cleaned list. Download section is flexible and you can customize export file. Easily separate all sections with some clicks. Connect our API to verify emails. Receive 100 free verifications to test API. Monitor your API usage and submission attempts. Interactive API documentation; test our API right in the docs. Webhook allows for the simple addition of single email checks. Fine tune different settings using multiple API keys. Custom enterprise solutions and dedicated environments. Integration support from DeBounce dedicated engineers. 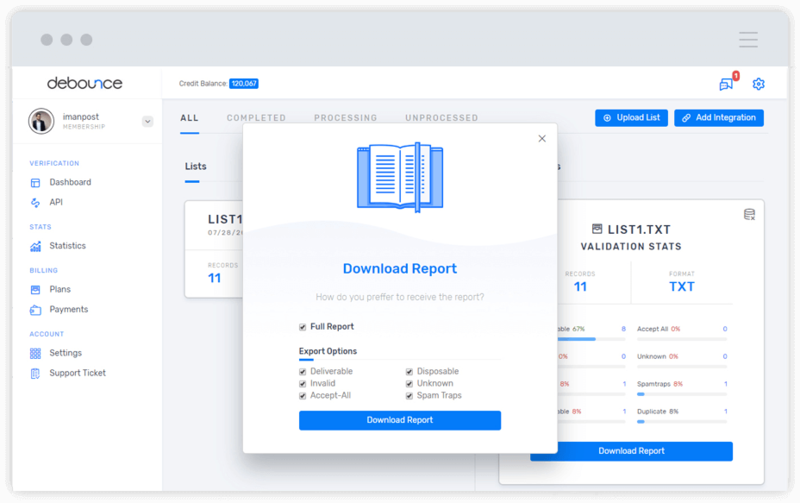 Powerful integrations to help you automate import and keep your list always clean.